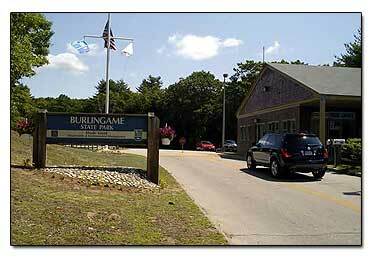 Burlingame State Park Campground is located in Charlestown, RI. It surrounds a huge pond called, Watchag Pond. As we drove through Burlingame State Park, this is what we saw. When you enter the park you encounter very tall pines which look really cool and picturesque. 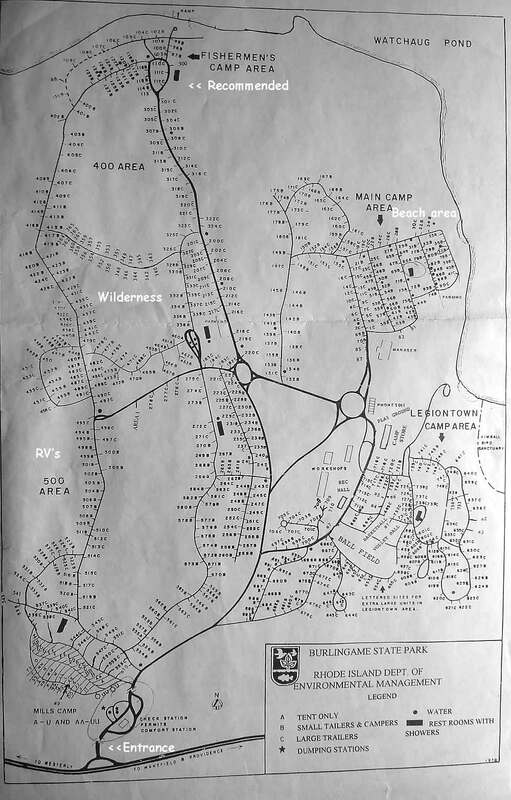 The campground is huge and divided into sections. They have 4 small cabins in the 100's section which is called the Fishing Area.When we parked and went into the office, here's what happened. She asked me if there was an area we preferred, I replied, we would like a spot near the beach. We didn't realize till later, that if you ask for a spot by the beach the campsites are closer together. They gave us #38 and the beach was practically in front of us, so we had a nice view for pictures, and it is considered part of the Main Camp area. She said if we didn't like the spot to come back and tell her, and she would change it. It is $14.00 for residents, $20.00 for nonresidents, which, the price has gone up from last year. I needed my driver's license and my car plate number. Each campsite has a firepit, and you can get firewood at the Entrance Office for $6.98, but we found some dead branches in the woods. 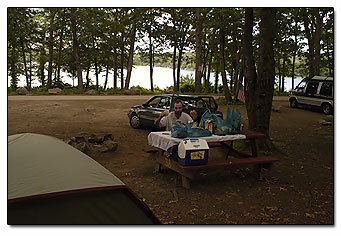 Burlingame Campground has a really nice Campstore at the campground, that we love to check out whenever we go there. Everything you could possibly need to camp, or whatever you left at home, they have, along with a large selection of souvenirs. We bought some camping forks to grill our hotdogs over the campfire for $2.98. The Campstore is open from 7 AM to 9:30 PM which is very convenient. They feature the Green Mountain coffee, which is the favorite of many travelers to New England. A sign in front of the Campstore reads, "Take nothing but photographs, leave nothing but footprints." Burlingame closes during the winter and they lock the gates. But people park in the parking area and take their dogs for a walk. 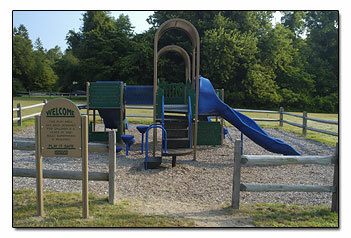 There are actually two parts to Burlingame State Park, the camping area and the picnic area. Both areas have beaches, but the one in the picnic area is bigger and nicer. 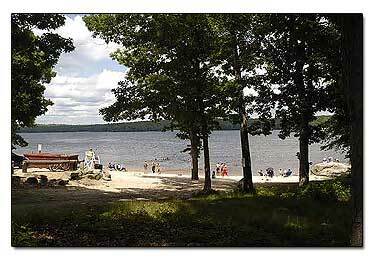 The beach area at the Burlingame campground is small and not the greatest, it has very little sand and small rocks. But hey, it's a beach! The big attraction on the campground beach is a huge boulder that is just sitting there at the water's edge. The kids like to climb on it, and I saw a teenager laying on it, reading a book. They have canoe rentals too.